Rhine-Ruhr, or Essen-Düsseldorf, is among the world's least recognized larger urban areas (Figure 1). Germany does not designate urban areas according to the international standard, and for that reason the Rhine-Ruhr does not appear on the United Nations list of largest urban areas. Yet, in reality this contiguous urban area is Germany's largest urban area, a position as it has held since at least the end of World War II. The Rhine-Ruhr is the third largest urban area in Western Europe, trailing only Paris and London. The area was one of the strongest early urban industrial areas in the 18th century and continued as a major manufacturing and coal mining center through the first half of the 20th century. The Rhine Ruhr is unusual in not having evolved around a single core municipality. The Rhine Ruhr has multiple core municipalities, which have grown together to form a conurbation, the second largest in the world following Osaka –Kobe – Kyoto. But the Rhine Ruhr is probably the most polycentric urban region in the world, with a minimum of eight older, large municipalities now linked by urbanization. These include Essen and Düsseldorf, which were until recently the two largest municipalities. In addition there are Dortmund, Duisburg, Bochum, Wuppertal, Gelsenkirchen and Oberhausen. Each of these eight municipalities reached a population of 250,000 or more by 1961. Like nearly all prewar municipalities in the high income world that had not expanded their boundaries, each of these has lost population since 1961. By 2011, the combined population of these eight municipalities was under 3.4 million, a reduction of 700,000 (Table) from their 1961 total (a 17% loss). 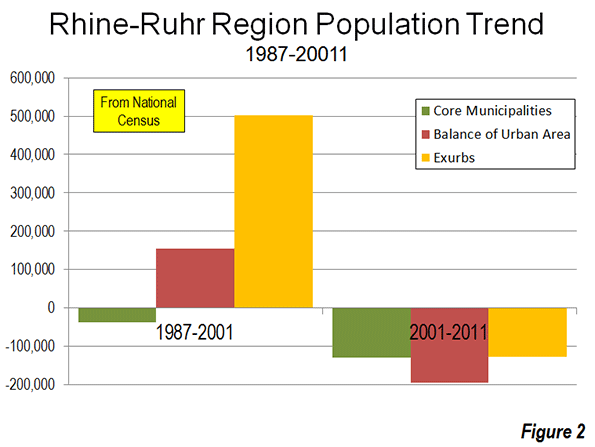 Data for the balance of the urban area and the broader Rhine-Ruhr region (Note 1) is not readily available for 1961. As a result, this analysis considers the Rhine-Ruhr region to consist of the Dusseldorf, Arnsberg and Münster subregions of the state (lander) of North Rhine-Westphalia, which had a combined population of 11.22 million in 2011, up only modestly from 11.06 million in 1987. The urban area has a population of approximately 6.5 million residents, covering a land area of approximate 950 square miles (2,450 square kilometers). The urban density is approximately 6,800 per square mile (2,650 per square kilometers), less than that of Los Angeles (7,000 per square mile or 2,700 per square kilometer) or Toronto (7,600 per square mile or 2,900 per square kilometer). Since 1987, the Rhine-Ruhr has added 161,000 residents, having gained 617,000 residents between 1987 and 2001, and losing 456,000 from 2001 to 2011. The eight older cities lost 170,000 residents from 1987 to 2011, while the balance of the urban area lost 42,000. The exurbs, outside the urban area have added 373,000 residents, and account for more than all of the modest growth since 1987. All three sectors lost population after 2001 (Figure 2). The Rhine-Ruhr is located in the lander of North Rhine-Westphalia, which has the largest population in Germany. Its growth, however, has been glacial. Since 1961, the average annual growth rate of the lander was 0.2%. This is one third the growth rate of the other lander that constituted the former Federal Republic of Germany (West Germany). North Rhine-Westphalia’s performance is stellar compared to the lander of the former Democratic Republic of Germany (East Germany), which have fallen back to their 1961 population, having lost 10% of their residents since 1990. Germany itself lost more than 2 million people in the last decade, reflecting its well-below replacement fertility rate. Based upon this rate, Germany could lose more than the 5 million more residents projected by United Nations projectionsto 2050 (to 75 million). But even within the slow growth environment of North Rhine Westphalia, the Rhine Ruhr region is falling behind as nearly all the growth has shifted elsewhere to the regions of the lander that surround other urban areas, Cologne (Köln), which includes the former West German capital of Bonn, and Aachen (which stretches into the Netherlands). Local authorities in the Ruhr Valley are forecasting a population loss of approximately 8 percent by 2030. The Rhine-Ruhr conurbation is organized around confluences of two rivers with the Rhine. The northern part of the urban area stretches from the west bank of the Rhine eastward along the Ruhr River Valley with the large municipality of Duisburg anchoring the West and Dortmund the East. The southern part of the urban area stretches along the Wupper River Valley starting at Düsseldorf and continuing eastward to south of Dortmund. The elevation at the two river junctions is less than 100 feet (40 meters). A transverse, low mountain range (Rhenish Massif) separates the northern and southern parts of the urban area (maximum elevation 800 feet or 300 meters), though much of the hilly area is urban. Without a dominant, large center, the Rhine-Ruhr has a lower transit work trip market share – 18 percent – than would be expected for a European urban area of its size. This is well below the 30 percent share of Berlin and the approximately 35 percent shares of Madrid, Lisbon, and Stockholm, which are all smaller than the Rhine-Ruhr. 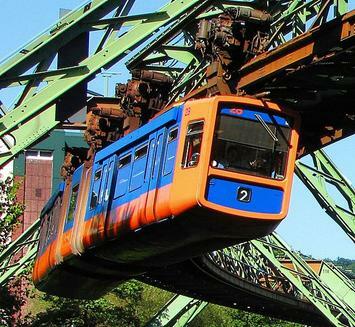 Wuppertal is home to one of the icons of mass transit, the Wuppertal Monorail, which opened in 1901. The Monorail is suspended for much of its route above the Wupper River, with supports straddling the river (such a configuration would probably not be permitted to be constructed today in any high-income world metropolitan area because of environmental regulations). The Rhine-Ruhr’s polycentricity requires substantial reliance on its road system. The region is well served by an extensive freeway (autobahn) system consisting of at least four east-west routes and five north-south routes. Traffic congestion is worse than in most US urban areas, but the Rhine-Ruhr’s traffic flows better than in any metropolitan area of similar size in Europe, according to 2012 data from the INRIX Traffic Scorecard. The average peak hour delay is 14.8 percent compared to “free flow.” This is less than one-half the average delay in smaller Milan (30.2 percent) and well below Paris (27.8 percent) and London (26.1 percent). In 2005, the Rhine-Ruhr had the fifth highest rated freeway access among 30 surveyed international urban areas. Shrinking cities (where cities are defined as metropolitan areas or urban areas) have been unusual in the high income world (Pittsburgh and Liverpool are exceptions). Even as core municipalities have lost population, such as in Atlanta and Copenhagen, metropolitan areas have continued to grow. This is likely to change because of the severe national population declines forecast in a number of countries. The Rhine-Ruhr, and other similarly situated cities, will face serious challenges in retaining dynamic economies and delivering public services in the years to come for an aging population supported by a smaller work force. Note 1: The entire Rhine-Ruhr and Cologne areas are considered by Germany to be the Rhine-Ruhr metropolitan area (ballungsräume). This article is limited to an area roughly conforming to the northern part of the ballungsräume. 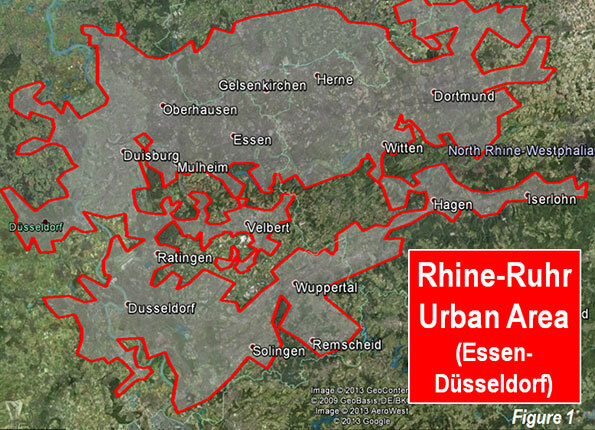 Eurostat defines a much smaller Düsseldorf-Ruhrgebiet metropolitan area that includes the Rhine-Ruhr urban area and most of the exurban area in this analysis. There is no international standard for the designation of metropolitan areas (labor markets). Note 2: INRIX classifies the Rhine-Ruhr as two areas (north and south). This is the population weighted congestion delay. Submitted by xygwfl1122 on Sat, 01/17/2015 - 08:01. Submitted by uofix on Mon, 09/08/2014 - 05:47. Submitted by Racaille on Sat, 06/15/2013 - 07:31. Yes. And a disgusting $hithole it is. Submitted by RaymondMAguero on Sat, 07/05/2014 - 21:02.